You can support us with your sponsorship at any level. Write to connect@wastewise.be to know more. Sponsorship helps keep our content free. Jodelle organized the Twitter campaign to crowd-source questions for the interview. She also designed the images that appear in this article. Nidhi edited this part of the interview for be Waste Wise. 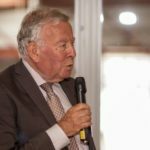 This is the second part of an interview with former Dutch politician and father of waste hierarchy Ad Lansink. 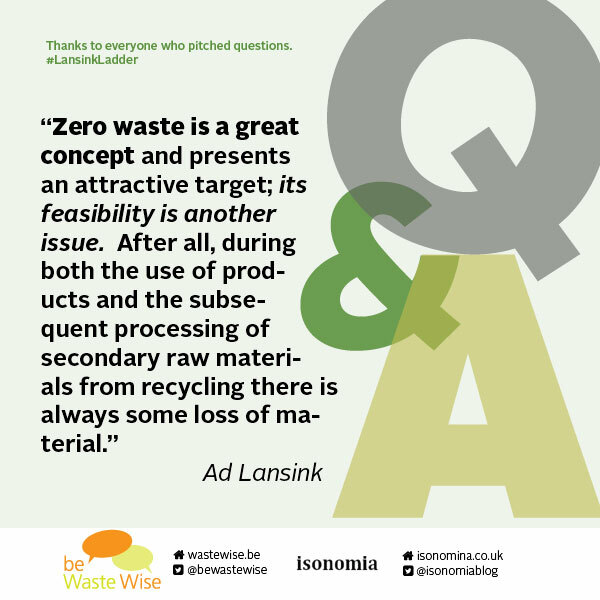 Isonomia’s Steve Watson conducted the interview with Ad Lansink based on questions submitted by be Waste Wise’s community. 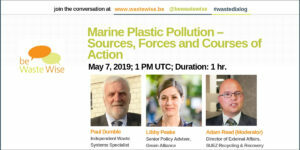 In the first part, which was published last month, Ad and Steve talk about the current status of waste management worldwide. Please share your thoughts in the comments section below. 1. Has the circular economy killed the waste hierarchy? Not at all. 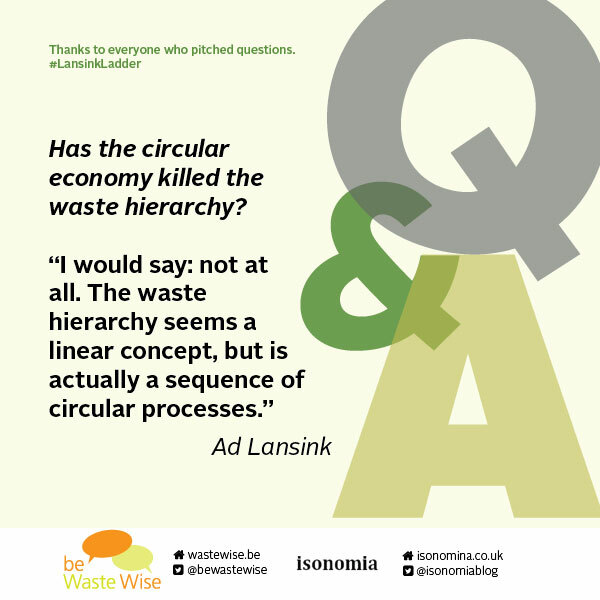 The waste hierarchy seems a linear concept, but its actually a sequence of circular processes. At any rate, this would be true if end-of-life-solutions – especially landfilling – faded out. Of course, incineration has two sides. First, there is the end-of-life aspect for rest materials and emissions (CO2), which will not get a second or third life. Second, there is the recovery of useful materials from bottom ashes and CO2 returning in the circular process of biomass. 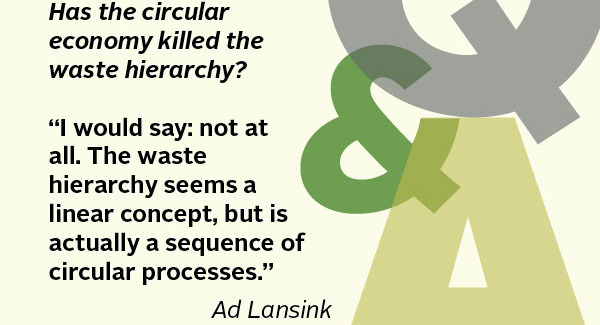 The upper rungs of the Ladder of Lansink (prevention, reuse of products, and reuse of materials after recycling) are essential for achieving a system of circular economy. The waste hierarchy stimulates innovation on and between each of the rungs. It forms the basis for ecodesign. The waste hierarchy also points the way for development of legal,educational and informative projects. The last point is especially important with regards to the challenging rung of prevention. 2. After all these years, is there anything you would change about the waste hierarchy? No, not regarding the main line of the waste hierarchy. 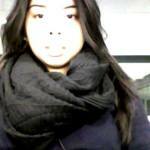 Experience has taught us that the overall model is simple, clear and understandable. Between some rungs, there seems room for sub-rungs such as fermentation of biomass. Incidentally, in practice and in legislation, the classic rung of incineration with production of energy has been divided into two rungs: energy from waste with a minimum energy production (see the R1 and R10 statuses in the European Waste Directive), and older incineration plants only aiming at disposal. In my original 1979 proposal the ladder had five rungs: prevention, source separation, post-separation, incineration with production of energy and functional landfilling (e.g. sculpting land formations for noise reduction). All in all, the waste hierarchy remains a universal and sustainable concept. 3. How close is it possible to get to Zero Waste? Zero waste is a great concept and presents an attractive target. Its feasibility is another issue. After all, use of products and subsequent processing of secondary raw materials from recycling, always results in some loss of material. It would be great if a recovery rate between 70%–90% could be achieved. A different approach is necessary for the use and recycling of food: food wastage should obviously be avoided. In that case however, the goal of zero-waste –i.e. 100% recycling – would again turn out to be unattainable. 4. What is the relationship between waste hierarchy and the concept of cradle-to-cradle design? Specifically, can product design succeed where waste management has failed in reaching the top levels of the hierarchy? The cradle-to-cradle concept (C2C) is only part of the order of preference, namely the reuse of products and materials. The core of C2C is product design to facilitate recycling and maximise the reuse of components and semi-finished products. C2C also aims at products with long lifetimes or products which facilitate the recycling of their component materials. The idea of using solely secondary materials in a circular system is, however, aiming too high. 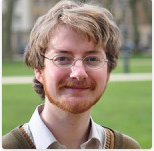 Moreover, Michael Braungart – one of the architects of C2C – always claimed prevention would be unnecessary, which is an incorrect assumption because prevention plays a very important role in the careful management of resources. For example, there is an actual shortage of some raw materials. Another questionable aspect of C2C is the assumption that all the energy necessary for product and material progress can be purely achieved from renewable sources. Without energy from biomass, that task will be unfeasible. 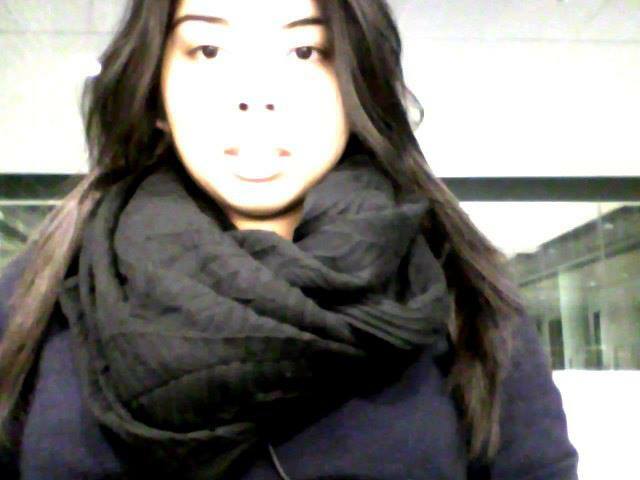 Also, with C2C, a loss of energy and materials will take place inevitably. So, the C2C concept is less universal than the Ladder of Lansink. 5. What do you think it would take – if you believe it is even possible – for our society to develop and sustain a circular economy that can function within the planet’s ecological limits? Nowadays,the circular economy is a ‘trending topic’. However, the transition from a linear to circular economic system is no easy task, despite the increasing optimism in this area. This wish has apparently been behind the European Commission’s stance for a juxtaposition of recycling and incineration. ‘Brussels’ now has high ambitions in promoting the circular economy. In the year 2030, they project the average recycling rate should be doubled to 70%, and in the same year, there would also be a general ban on landfilling in Europe. Admittedly, support for the circular economy grows. But the question is whether a rapid and complete transition to the circular model is feasible, now that globalisation becomes increasingly important. Apart from the finiteness of a few materials, components and products, the free market has its own requirements and conditions. The often advocated transition to a ‘lease society’ is possible under some areas (such as the automotive sector), but elsewhere it encounters practical difficulties. Think of free consumer choice and don’t forget the value of ownership. In turn, manufacturers point out their assigned producer responsibility. If the circular economy is not to become an empty concept, then a lot work has to be done in almost all related domains: fundamental and applied scientific research, design and production of (new) materials and products, development of management tools, and last but not least, the development of thorough insight into all that society needs to function. The circular economy will not be successful without prevention and recycling. With expansion of recycling and reuse, ‘down-cycling’ should be avoided as much as possible. Furthermore, with greater emphasis on a ‘biomass economy’, politicians need to keep an eye open for food issues. Also, the unequal distribution of global wealth is frequently overlooked in discussions on the circular economy. Without concrete, feasible implementation proposals and innovations, the circular economy cannot function. The real barriers do not concern the planet’s ecological limits so much, but it does concern social behaviour, free market, globalisation and, of course, time.